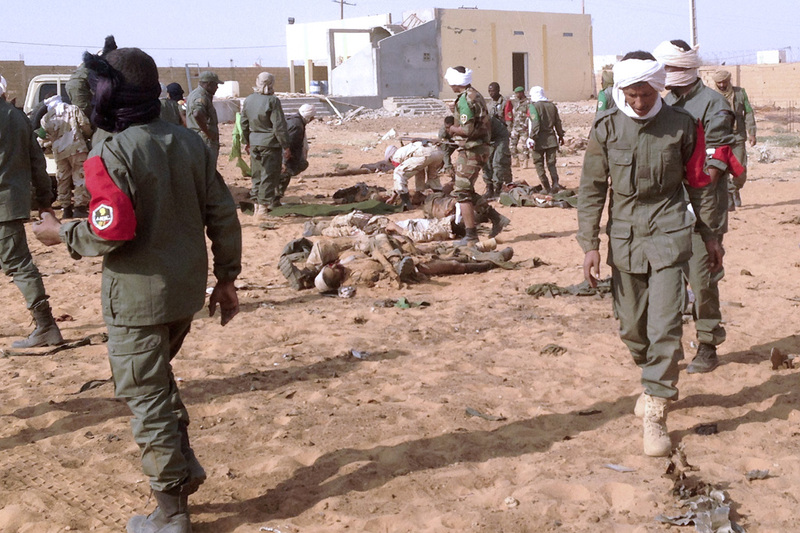 Military sources in Mali announced the arrest of five people on suspicion of involvement in a massacre that killed more than 160 people from the Fulani ethnic group in the center of the country, on Saturday, 23rd March. Hunters within the Dogon ethnic group, which has a long history of tension with the Fulani over access to land, are suspected to have carried out the massacre in the village of Ogassogou, home to the Fulani herding community near the city of Mopti, in central Mali. A local councilor in the area, Oumar Diallo, told AFP news agency that “the death toll had climbed to 160”, and “will probably be higher still” and denounced the attack as “ethnic cleansing”. An AFP reporter on Monday said many homes in the village had been burned down and the ground was littered with corpses. Another witness, who helped count the bodies last Saturday after the massacre and described the arrest of children and women in the houses before they were burned, said: “They did not spare anyone. They burned everything with gasoline and killed everything that was still moving with military weapons”. A 75-year-old survivor, Ali Diallo said: “I have never seen anything like that. They came, they shot people, burned homes, killed the babies.” They carried out the horrific attack, in which the victims were shot dead or beheaded with machetes, without being deterred. This brutal attack occurred despite the presence of Malian forces and United Nations peacekeeping forces known as MINUSMA, consisting of 15,000 troops, who came to Mali with the aim of achieving security and stability. Malian President Ibrahim Boubacar Keita came out to echo promises to beef up security and said: “We need security here – this is our mission”, vowing to “achieve justice”. Instead of providing this security to his people, he sought refuge in the colonial West and warned them of the consequences of the fall of his meager throne, which protects the interests of the West in the region. Meanwhile, his Prime Minister urged the UN forces not to withdraw from Mali after their failure to achieve any security or safety, warning that any reduction of the MINUSMA forces will end up endangering the achieved “fragile progress” to end the conflict in Mali. Maiga in his address in the Security Council said, “Our country is acting as a dam against the terrorist danger, and we must not underestimate the dimension or the capacity of this movement to move beyond our borders or even beyond the continent.” Which security will be achieved by this government which has lost control over large parts of the country and declares its security failure?! It is noteworthy that the violence is not new to Mali; it has been repeated since 2012 with the start of armed conflict in the north and the control of anti-government groups in major cities. But the French intervention, supported by international forces, has increased the level of tension in the region. The situation has recently shifted from the usual state of tension to a brutal ethnic nature in the center of the country. It should be noted that in the Republic of Central Africa, during the repeated waves of ethnic cleansing since 2012, the Fulani Muslims have been severely harmed in the same way, whereby armed groups kill unarmed civilians and then burn and destroy villages and towns. This is inspite of the French intervention and military support of more than 14,000 UN peacekeepers. The same tragedies are repeated in every country where the Kafir colonialist is given a way over Muslims, starting with Bosnia and Herzegovina, through Indonesia, Burma and other Muslim countries where darkness has prevailed. And the efforts of leaders who seek the help of the disbelievers and leave their country to the colonizer to provoke corruption and chaos and spread the scourges of racism and sectarian strife, their efforts will not succeed. Concentrating the ideas of Islam in the society and bringing them to existence and then making them control people’s relations will bring an end to the abhorrent sectarianism and regionalism and restore security and safety to the Muslim countries. This can only be done by lifting the hands of the oppressors from organizing our affairs, and by applying Allah’s law in His land, so that we will satisfy our Lord and rejoice in both realms. Oh Allah, lift your anger and wrath from us, O Allah protect us and protect our countries. Next PostThe Use of Live Bullets to Remove the Peaceful Protesters is a Crime that Allah Ta’ala Hates!